I have borrowed an O'Reilly's book Data Science from Scratch by Joel Grus from the library. The examples in the first chapter weren't interesting in their problem content, as I am not that interested in the social networks. But there was a nice visualization of the network and I got interested in learning first how to visualize networks. I read the whole first chapter, and there is nothing. I read a chapter on visualization, and there are examples for scatter plots and histograms, but no networks. I ended up going to he chapter on analyzing networks, but there was nothing there either. Now interested in the problem, I decided to hit the Google and try learn by myself how to visualize it. I took an episode of a series that I recently watched and decided to get the data by rewatching the first episode. I ended up using Networkx and matplotlib, simply because that was one of the hits on Google. The picture above is the visualization that I ended up creating with the code that is written down below. #Creates a new graph, puts all people there as a node. 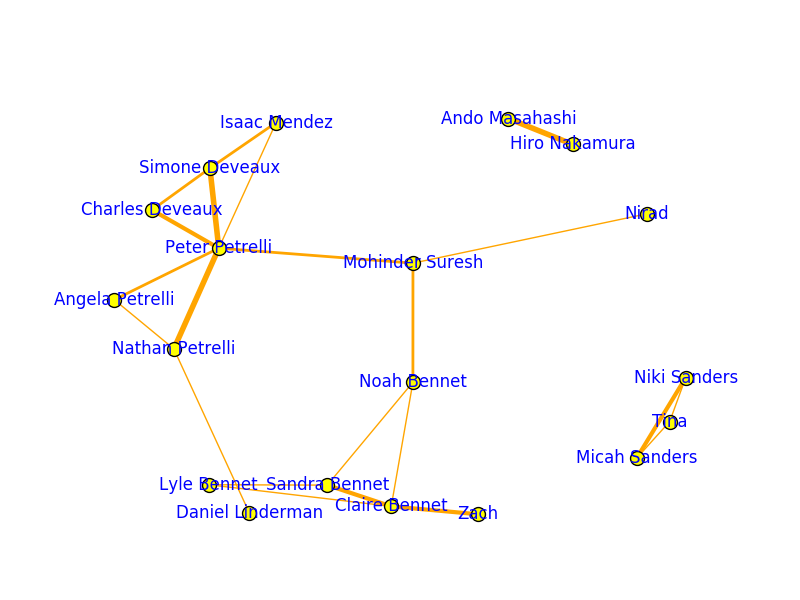 #Puts pairs of people that had interaction in the episode in a graph as an edge.